His laughter was shrill in the thin Martian night, echoing against the rocket's skin, and drifting off across the red desert. In his laugh was 8 crazy climbing note of lonely fear. The symphony's theme was changed, forever, to the horror that never existed here before the rocket came. Harmonies and sustained notes in the Minor were creeping in. The sombreness of the key of G, the brutal sinister and gloom dramatic violence of C, and the sad agitation of E.
He wondered how long before it changed enough to be able to destroy him, too, with its hate. It was funny, he thought, but that first night, when we landed, none of us, except Clevenger, knew why we were here, but they sensed the purpose. And at first, no one knew what to do, and no one was aware of the music. . . . "
FIRST, the necessary routine stuff. The testing of atmosphere, and the observation of surrounding terrain from the safety of the rocket's interior. There was the familiar Canal, the distant city, the barren mountains, dead sea-bottoms. And that was all. No eight-legged beasts or giant birds under the double moons. Then they got out and stretched and breathed the clean crisp air, and looked at each other as though not quite sure they actually had arrived and were on the Martian desert, or whether they were merely ghosts of an idea. They were spared the excitement of surprise at finding the canals and the city, for that had been observed and charted through the Palomar eye. Burkeson felt the music at once, but remained silent as he tried to analyze it. The others didn't seem to hear it. His hypersensitive and musically trained inner ear registered the sounds that were apparently inaudible to the others. A delicious alien sensation seemed to swim through him with his throbbing blood. Captain Ballance, a blond, neatly uniformed giant, stood and looked at the distant spires of the gleaming city. "The big question is," he said, "—life." And the others were obviously thinking of that too. Burkeson's head was cocked to one side, puzzled wonderment in his eyes. No one noticed his odd reaction. 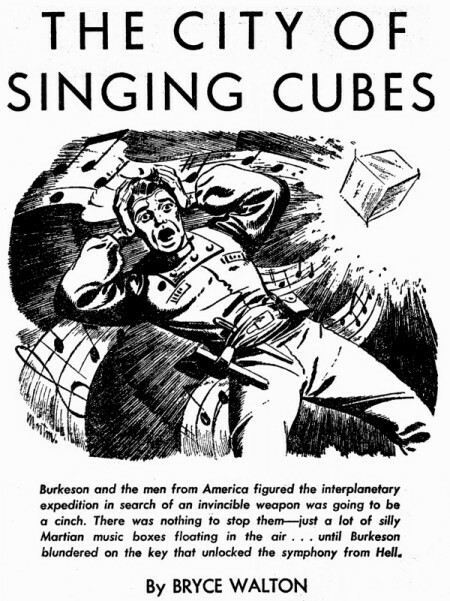 Burkeson was an oddity anyway, a dreamer, an unrealistic sort, except in his specialized field of audio engineering, and electronics. Ferrell, the atomics man, was sifting sand through his fingers and noticing that it felt much like any other sand would feel anywhere, on Manhattan or Long Beach. Lt. Dobson was breaking out a case of rations for a little celebration, though no one seemed festive. Ferrell walked over beside Burkeson and Ballance. He also looked at the distant city. Its softly shifting pastel harmonies flickered in the moonlight. Ferrell said. "The question is, how alien is life here likely to be?" His small fat body shivered, and he folded his arms. "Maybe we can't get along with 'em. Maybe they'll be super-intelligent, or savages. In either case, maybe they'll be so different, we'll never be able to get anyplace with 'em." Capt. Ballance's cold hard face turned to the big neutron cannon mounted between the rocket's two skin casings. His voice was grimly final. "We're not worried, Ferrell." Burkeson said softly. "But where would we want to get with them? That's the thing I want to know. There hasn't been any enthusiasm here like you'd expect on a first flight to Mars. It's all too grim! I want to know what we're doing here?" "Why do humans do anything?" Ballance said. "Might as well ask that. Why did western culture expand, and murder primitives by the millions just to expand? Who the devil knows? Economics, instinct, geography, a complexity of causes. There may not be any general reason we're on Mars now, except that it's just a way-station to keep on expanding." Clevenger came up with a bottle of beer in his white hand and a thin smile on his sardonic face. Clevenger, the North American Defense Federation Representative, whose presence lowered Ballance's title of captain to only a name. As a representative of the NADF, Clevenger was part owner of half the world, and his words directly affected the private and general lives of billions. Clevenger said. "You spoke with broad generality, Captain. Now that we're here, and not just because our aesthetic comrade, Burkeson, has specifically asked for it, I think we should all know why we're here. Get any romantic nonsense out of your heads, men. This is business." He looked at the city. Hungrily, Burkeson thought. "We're here to see if there's anything we can use," Clevenger said softly. "Especially in the way of—weapons." BURKESON was sick. For a second, he forgot the strange music from the city. All this planning, and expense, and the dreams man had always had of going to the stars—the great black mystery of space, broken—and for what? A better weapon!